Sorry about the forums (and other web site features) being shut off for over a day. These Tuesday outages are really taking forever. I guess we've been really busy, which means our tables get ridiculously fragmented throughout the week. Plus I noticed our database is easily 50% larger than it has been about 2 months ago. And the replica lost a couple of its CPUs recently (it's a used/donated system and the CPUs were known to be flakey from the start). Anyway, since the normal recovery procedure was so painful last week I opted to keep all web page database lookups offline until the replica was caught up. Once again, I'm sorry for the inconvenience. To make up for that, how about some videos from the SETI@home 10 year anniversary? I'll link these to the home page soon enough. Consider this a sneak preview for those who read these threads. Let me know if there are problems downloading/viewing these mpegs. Data recorder-wise... After all the effort to work with what we got, we're finally throwing in the towel on the current set of data drive enclosures. We have a plan B and plan C already in place - just a matter of deciding which one to enact. Meanwhile, I'm pulling old data off the archives at a pretty good clip - hopefully fast enough to keep up with demand. Otherwise, I'm still working on NTPCkr and radar stuff. And I adjusted the stats scripts that generate the numbers on the server status page. The Astropulse numbers up until this morning reflected version 5 workunits/results, now they reflect version 5.05. Nit-picky comment. It is not June 1 but July 1. I know I want the last month as a do over to. Message 912989 - Posted: 1 Jul 2009, 20:04:05 UTC - in response to Message 912982. ....I opted to keep all web page database lookups offline until the replica was caught up. Once again, I'm sorry for the inconvenience. Message 912997 - Posted: 1 Jul 2009, 20:16:51 UTC - in response to Message 912982. The Astropulse numbers up until this morning reflected version 5 workunits/results, now they reflect version 5.05. Will a new option be added to the preferences page for v5.05 for opt-in and opt-out? Thanks for the update and the videos! Q: Can we expect more day long data driven web page outages? Quote "01/07/2009 23:00:37	SETI@home	Message from server: (Project has no jobs available). Server status - "Results ready to send 1,568,646". Message 913056 - Posted: 1 Jul 2009, 22:21:22 UTC - in response to Message 913053. Message 913060 - Posted: 1 Jul 2009, 22:29:02 UTC - in response to Message 913056. And out of all that work available I get a message that the project has no jobs available. I always read your thread each day.. I dont always post as..my mouth's not required. I have talked about this before.. I really think you need to cut your losses and move some of the data from MySQL over to archives. Your poor servers are trying so hard to keep up but unless you replace them with something that can handle it, its only going to get worse as the tables grow to 100's of gigs. Your a genious.. Write some code and move the table entries based on date(or something) over to a big ol' hard drive and put it away somewhere safe. Myabe even replicate it just incase. There is so much data just from the old forums here, it would probably choke my server's 480 gig just trying to deal with that let'alone the results in/out and storage. Good Grief! I can already smell the cpus smoldering. I understand the need to keep the Results Data.. I have read your posts about this before and it's all clear to me. Breaking that up would make it a MF to put back together so .. best to leave that one alone. Anyway... When are you guys going to 'bite the bullet' and get a the power for the server you need? I posted a link a while abck to a killer 8x dual core xeon (16 cores) IBM server with heaps of memory and 3 new raid drives that was listed on Ebay. This thing was at $999.00 and no one bid on it. You could a had it for 999.10 USD. Sad thing.. it weighed almost 200 pounds! Shipping would cost a chunk! If you took a poll, I think you would find that most here would rather the servers be off for 5 days then take a chance on losing any of the results data. 10 years is an long a## time of collection. I dont think anyone can even touch it. I know a lot are looking forward with huge.. 'on the edge of the chair' eggerness to see this data crunched down. Besides ET.. who knows what this will produce? There may be things in there that no one expected! Message 913091 - Posted: 1 Jul 2009, 23:44:40 UTC - in response to Message 913060. There is this job to hand out work and it has a queue. Here is how it works. A guy behind a window (the job) gets a request for a work unit and he grabs one off the queue and hands it to you. He keep doing this until the queue is empty. When it is empty he hangs up a sign No Jobs Available and swivels his chair around to the database and grabs 100 work units to fill his queue up. When he is done and his queue full again he turns back around and takes the sign down. When the load is light, the man is facing you most of the time and you get work most of the time. When the load gets very heavy the man spends most of his time filling the queue from the database and you see the no work sign. It doesn't matter how much work is available to fill his queue. thanks for the anology - since the guy is too busy I guess I just shut down! Message 913111 - Posted: 2 Jul 2009, 0:16:37 UTC - in response to Message 913106. If you shut down, it'll help those who don't, and it'll help the servers a little. If you don't shut down, the guy does turn around and face customers and pass out work -- and you've got as good a chance as anybody to get that work. Message 913130 - Posted: 2 Jul 2009, 1:03:05 UTC - in response to Message 913091. Have checked the status page the last hours, shouldn't the "Results out in the field" get bigger? MBs are again under 4mill, don't think APs have risen. Last WU I got was about 4 hours ago. Message 913138 - Posted: 2 Jul 2009, 1:30:46 UTC - in response to Message 913106. That's not the answer. Another request just 30 milliseconds later could be granted some work. You just need to keep asking and hit it right. Thank you for the videos. They're entertaining but also frustrating, because there's discussion of the slides but in general the slides are not shown. Are the ppts posted anywhere please? Message 913163 - Posted: 2 Jul 2009, 3:21:25 UTC - in response to Message 913138. 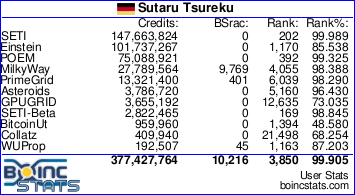 That is why there is an automatic random back off built into BOINC. Message 913241 - Posted: 2 Jul 2009, 11:09:24 UTC - in response to Message 912982. Does this mean AP workunits are now astropulse_v5 version 505 or astropulse_v505 version 505? AFAIK, AP V5.05 is a new application. It can't be calculated with the old opt. V5.03 app. You need to wait that the opt. crew publish a new opt. app. Or you calculate with stock AP V5.05 . Message 913249 - Posted: 2 Jul 2009, 11:20:40 UTC - in response to Message 913244. Thanks Sutaru, the link definitely answers my initial question.